Named There are 5 products. Sizes : 32-46 (EUR) Skill level : simple Recommanded fabrics : Choose a light- to medium-weight, woven or knit fabric. 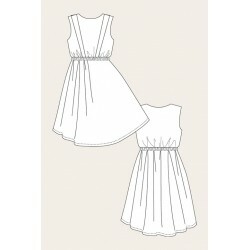 Make the dress with a lining if your fabric is non-stretch and difficult to hem. Instruction Booklet : English. 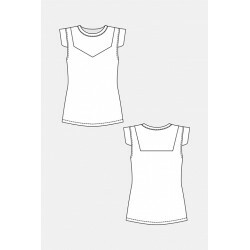 Sizes : 32-50 (EUR) Skill level : simple Recommanded fabrics : Choose a firm knit with approximately 50% stretch. The sample is made of ponte. Instruction Booklet : English. 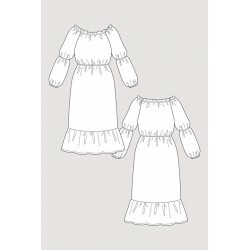 Sizes : 32-50 (EUR) Skill level : Average Recommanded fabrics : Choose a light fabric for both variations. Sizes : 32-50 (EUR) Skill level : Simple Recommanded fabrics : Choose a lighter jersey with also approximately 50% stretch. The sample is made up in a rayon blend jersey Instruction Booklet : English. 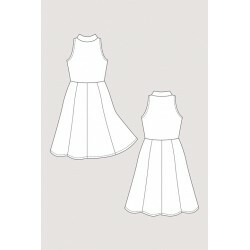 Sizes : 32-46 (EUR) Skill level : Simple Recommanded fabrics : choose a light jersey for the bodice, and a contrast fabric, such as lace, for the yoke Instruction Booklet : English.